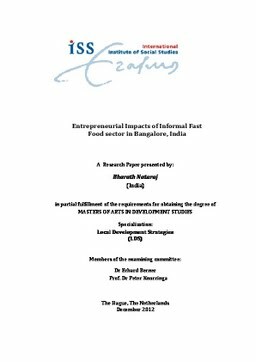 This research paper is an attempt (as part of M.A degree) to understand the impacts of informal fast food sector in India, focusing on creating entrepreneurship opportunities for low/uneducated, unemployed and rural migrant workers, who would otherwise contribute nothing much to the local economic development. As personally experienced while having lunch at one of the roadside fast food in pushcart and hearing the entrepreneur’s story of how he engaged in this business, stimulated me to carry on the this research work, and to showcase their impacts to the mainstream academia, which can further explore this sector deep. This exploratory study result shows that even though the majority of them in this sector are survivalists but yet reveals that they are engaged in this entrepreneurial activity with the motivation to be self-employed, also with the hope that this will increase their income and improve quality of life; while not being able to find jobs in formal sector. And the growth-oriented entrepreneurs are able to create job opportunities for local as well as for urban migrant workers including women. This research paper concludes that informal fast food sector have been main sources of income for the entrepreneurs involved in the business, and this sector have provided livelihood entrepreneurship opportunities for many in developing countries as well as contributing to local economic development. However there are no proper definition informal fast food sectors, therefore this research also suggest a typological definition which helps in collecting data and has relevant policy implications. In due course of the research there were also many interesting findings have appeared, such as the challenges of these entrepreneurs, Gender distribution, sustainability issues, support system, motivational aspects, etc. these have been discussed more in the following chapters.